I can't believe we started these lanterns almost a year ago. After seeing them all hung up tonight, it makes me so happy we finally finished them. 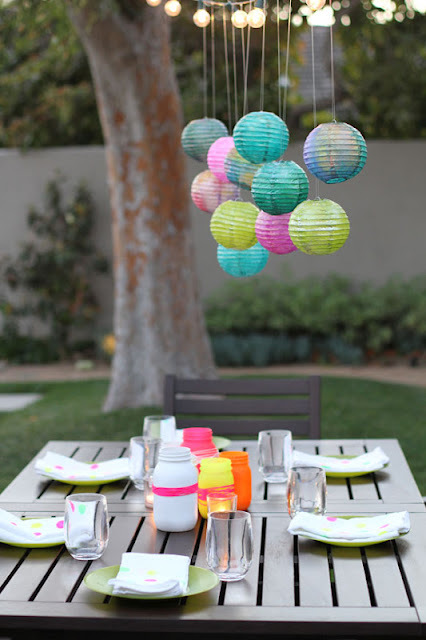 The idea for these lanterns originally came from a craft we did at our local Rancho, although the kids all used the same color of paint and hung them on the ends of sticks to use as fishing lanterns. I've wanted to replicate them ever since, only to hang in the backyard. Turns out the project was worth the wait. 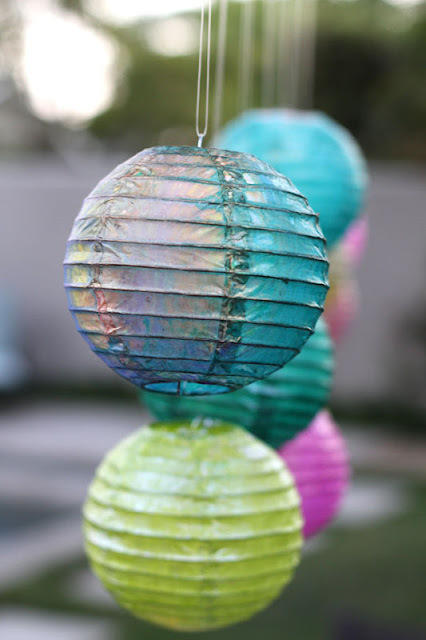 To make your own, you'll need some paper lanterns, iridescent watercolors in gold and/or silver, watercolor paints, and paint brushes and spray bottles. 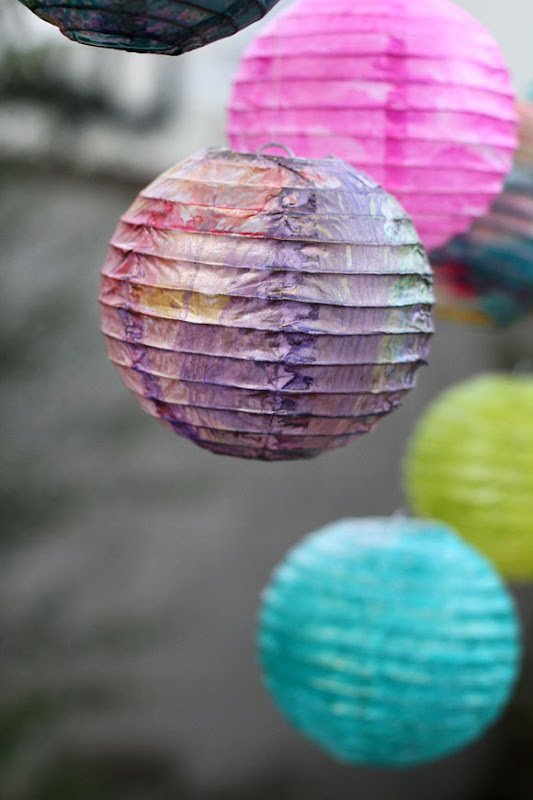 Our paper lanterns are from Discount School Supply and held up nice to the layers of paint. 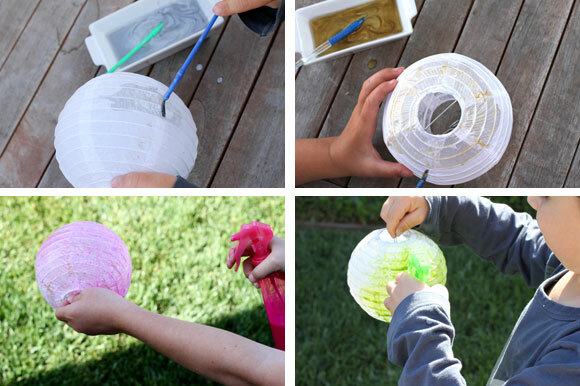 I'm sure if you handled them gently, standard paper lanterns would work just as well. And in fact I buy all my watercolors from Discount School Supply because they have the best price on the nice big bottles. We use watercolors a lot and these bottles have lasted us at least a year. The spray bottles were just cheapies from the Dollar Store. The kids begin by layering on the iridescent watercolor paint, making sure not to get them too wet. They just need a light, thin layer to show through the paint, and the more they soak them, the longer they'll take to dry. 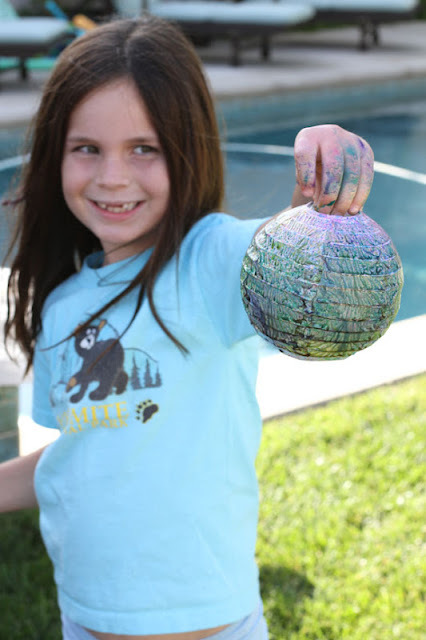 After they've painted on the iridescent color, let dry for a few minutes, and then lightly spray on some watercolor paint in whatever color(s) they choose. 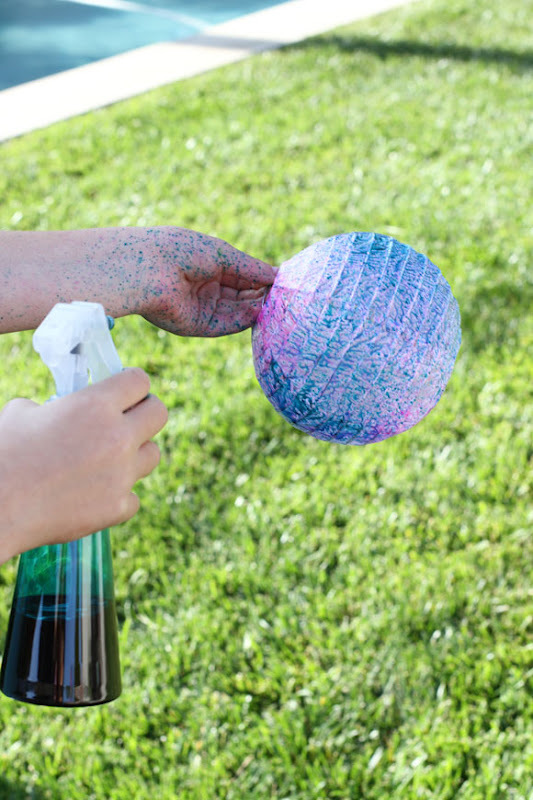 They could also brush on the watercolors, but using the spray bottle is a novelty for them. 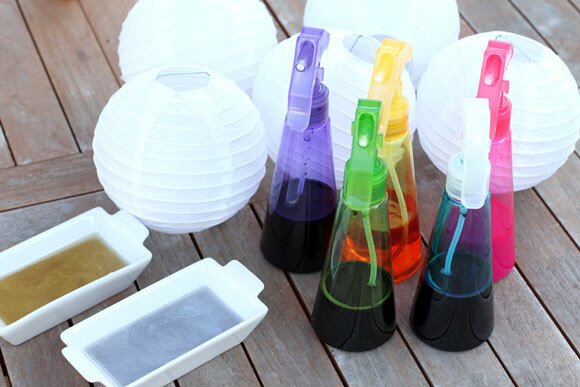 While it works better to hold the spray bottle away from the lantern, spraying up close like Syd did won't harm it at all, it just won't get a "sprayed" look to it. The kids hands will get dirty so dress them in play clothes, as sometimes I have a hard time getting watercolors out. They'll take a good hour to dry completely. 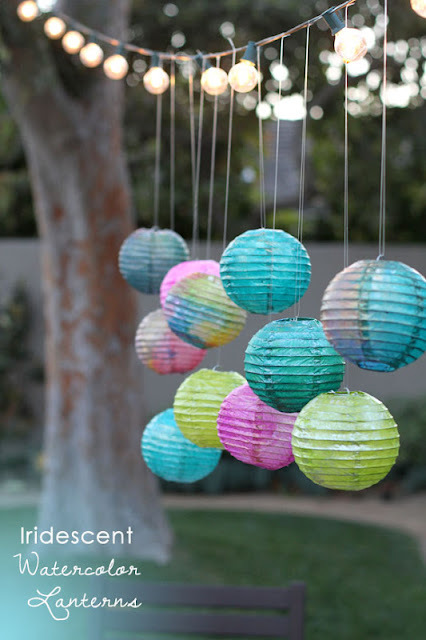 Once dry, you can hang them in their room, on a stick to bop around with, or on cafe lights in your backyard, like I did. I used clear monofilament wire to hang theirs. Once dry, the iridescent gold and silver paint really does show through, and all that mess of color Taylor sprayed on ended up looking like a very pretty, swirly, rainbow of colors. 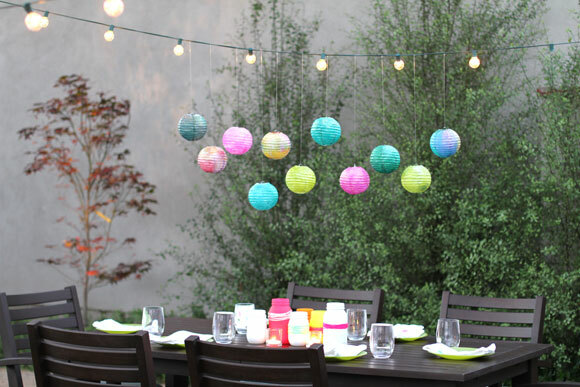 A craft easy enough for a kid to do all on their own, with results sophisticated enough for a backyard dinner party at twilight. 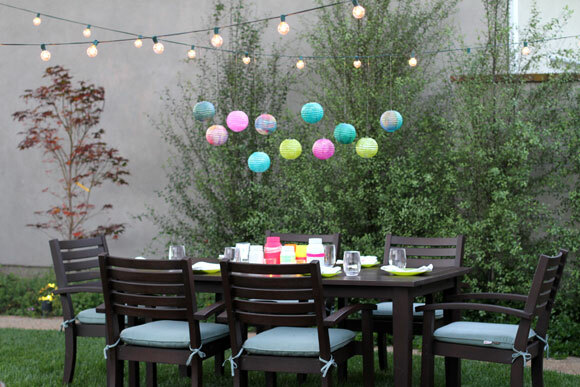 These will surely be hung in our backyard all summer long. Love!!! Tell me about the colored jars in the center of the table!!! 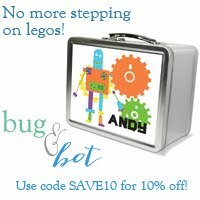 I've been saving my jars and would love to create something fun like that with them! SUPER CUTE! Crossing my fingers you'll share at my party! Saturdays at Seven! 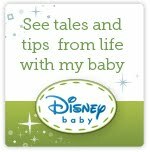 How to Get a Clean, Sand-free Little Girl That Smells Good Too!